As we've all come to find out from numerous reports and news articles, Roberts is clearly focused on fostering a culture of open communication, trust and grit. 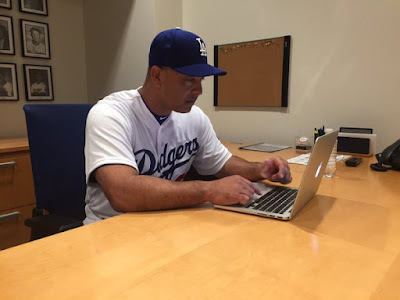 More importantly, he aims to bring back the "Dodger Way" to play the game. That means these Dodgers' will compete at every moment. They will seek to improve from one day to the next. So far, Dave Roberts is saying the right things. Given the background of the new front office what are his thoughts on sabermetrics? And how about our top prospects? Now to the lighter side. Apparently, Justin Turner will have the honor of adding grit to Roberts uniform. Unfortunately, we won't be seeing grey beard. I think this is the kind of advice we all need to take notice of. Here's a final thank you from our new skipper. *Photo at the very top via @Dodgers on twitter.